THE LOCAL LOTTO Roadshow team out and about in June. This summer is a busy and exciting time for Ripon community. As well as co-ordinating the Connecting Ripon network of local charities, our HARCVS team supports two new initiatives which aim to strengthen community connections: Ripon Together and THE LOCAL LOTTO. 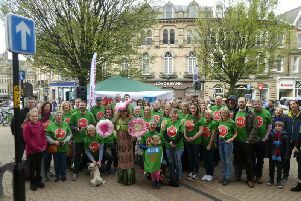 Ripon Together was formed to improve the vitality and prosperity of the city, bringing residents and people from all sectors together to achieve positive change. If you live or work in and around the city, care about its future and want to make a positive difference, why not go along? The Ripon Together team would be delighted to see you. If you decide to become a Member, you can join at the event. Membership only costs £1! By working together we can achieve wonderful things. You can let the organisers know you are going along by visiting www.eventbrite.co.uk and searching for Ripon Together or emailing info@ripontogether.com. The Get Together will be a chance to hear an update on the plans to celebrate Yorkshire Day in Ripon this year, on Wednesday 1 August. The day is a fantastic opportunity to showcase all Ripon has to offer and the city’s great community spirit. The Market Place will be filled with activities during the day and there will be an evening programme of entertainment. Ripon Together is also supporting events and activities to commemorate the centenary of the end of World War One. A Ripon Memories Coffee Morning is taking place at Ripon Library, on Monday 9 July from 10.30am to noon, to collect information on soldiers who returned from the war, any family stories and photos with a view to putting together an exhibition in the library. For more information on this event please contact Claire Thompson at the library Claire.Thompson@northyorks.gov.uk. During the last couple of weeks, I’ve been enjoying the lovely sunny weather out on the road as part of the team promoting THE LOCAL LOTTO for the Harrogate District to local good causes. HARCVS is a partner with Harrogate Borough Council and Two Ridings Community Foundation developing this project and it’s been good to see a really positive response for this new fun way for our vital local charities to raise funds. THE LOCAL LOTTO enables local people to support the good causes they care about the most. It’s free for good causes to join and money raised will make an important contribution towards our local voluntary and community sector. There are no set up costs or admin fees for good causes, just a simple online form to set up your own lottery page to send to your supporters to buy tickets – and they have the chance to win up to £25,000! Good causes in Ripon can sign up now. THE LOCAL LOTTO tickets go on sale on Tuesday 17 July and the first prize draw takes place on Saturday 8 September. Visit www.thelocallotto.co.uk which has a really good FAQ page to find out more. We’ll be sharing information about all these opportunities and more at our next Connecting Ripon Network meeting on Wednesday 11 July from 1pm to 3pm, kindly hosted by Network member Masham Town Hall. If you’re involved with a charity or community group in the city or surrounding area why not join us? Visit www.harcvs.org.uk/ConnectingRipon to find out more.